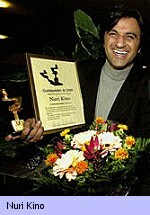 An Assyrian freelance journalist, Nuri Kino, has been nominated for the prestigious Swedish journalism award and the gala will be on March 24th, 2001. Mr. Kino has worked with Bahro Productions on documentary films which have been featured in many Swedish news telecasts. "The Unheard Scream" documentary, will be opening in film festivals in major European countries. The film that he and Yawsef Beth Turo have made has been dubbed a masterpiece in documentary films relating to the Assyrian genocide during the years of 1914-1918 in the Middle East.